M. Schwartz & Gettinger Feather, INC. prides themselves on their ability to create countless flower arrangements. Whether you have ostrich, goose, pheasant or rooster tailfeathers included or not, MSG can create beautiful arrangements for any occasion. 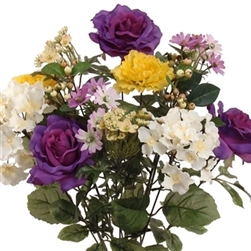 Our mixed flower bushes are no different and we take great care to make sure you have flowers in full bloom that will last. MSG has no shortage of flowers to choose from for your arrangements either. Our mixed flower bushes can be comprised of many different flowers, such as; dahlias, daisies, mums, pumpkin bushes, hydrangeas, lilies, peonies, sunflowers and so many more. Our mixed flower bushes make for great centerpieces during the spring and summer months and add an asthetic to your house that creates a more welcoming feel.